Sunday, May 1, 4 pm – 9 pm. 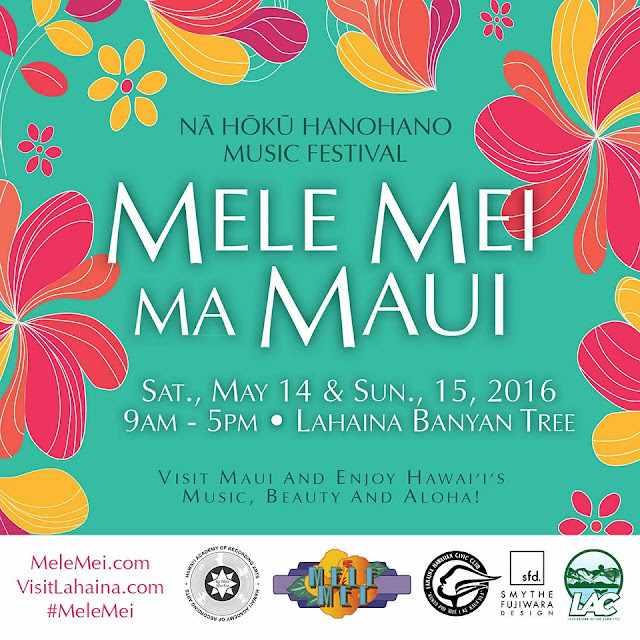 2016 Lei Day Heritage Festival. Fashion show, food, music, crafts. Free! Bailey House Museum, Wailuku. Call the museum at 808-244-3326! 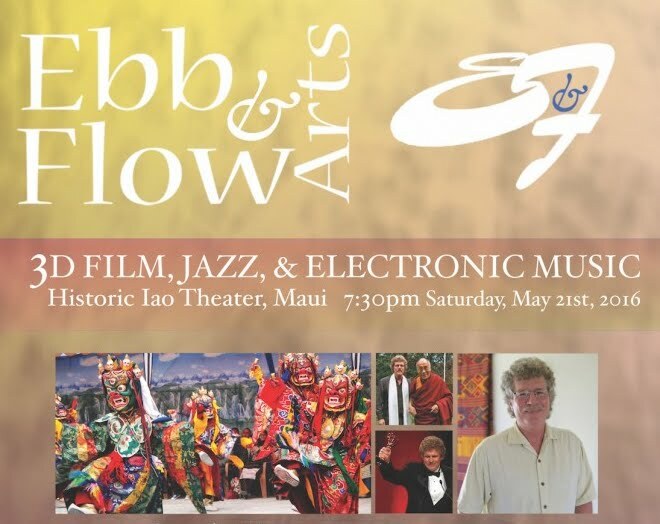 Sunday, May 1, 7:30 pm, May Day concert featuring Robert Cazimero at Maui Arts & Cultural Center, Kahului. Pre-show festivities start at 5:30pm (including hula, leis and island style food). Sunday, May 1, 8 pm - ? May Day Mystical Funk Out. Party till you drop. Music, dancing, costumes, face painting. Makawao Union Church. Sunday, May 1. 9am – 2pm. Spring Craft Fair. First level of the Macy’s parking structure. Queen Ka’ahumanu Center, Kahului. Thursday, May 5. 6 pm – 9 pm. Cinco de Mayo party at Sangrita Grillwith a special menu and live flamenco dancing. 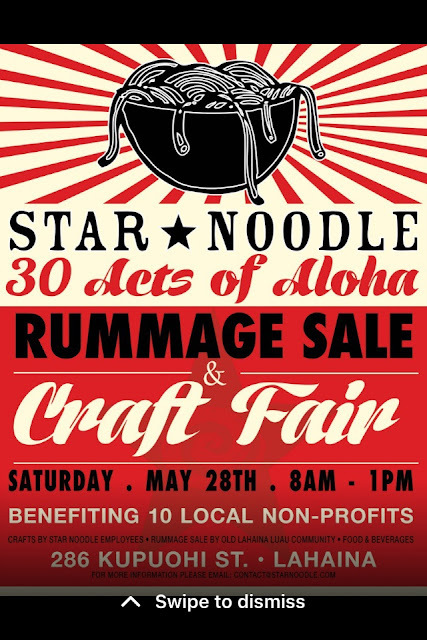 Portion of proceeds benefits Lahainaluna High School. Thursday, May 5, 7 pm. Twain vs. Tita: The Sesquitennial Sandwich Isles Tour. In honor of Mark Twain’s visit to Hawaii 150 years ago. What if he had met Tita, one of Maui’s funniest women? Friday, May 6, times vary. May Day events at the Fairmont Kealani. (Click on the website and then click on “May.”) Hula performance at 10 am, lei making at 5 pm, keiki hula show at 5 pm. Free. Wailea. Friday, May 6, 10am - noon. Lei Day at Montessori School of Maui. Makawao.Watch students perform May Day dances. FREE! Friday, May 6 – Friday, May 13. 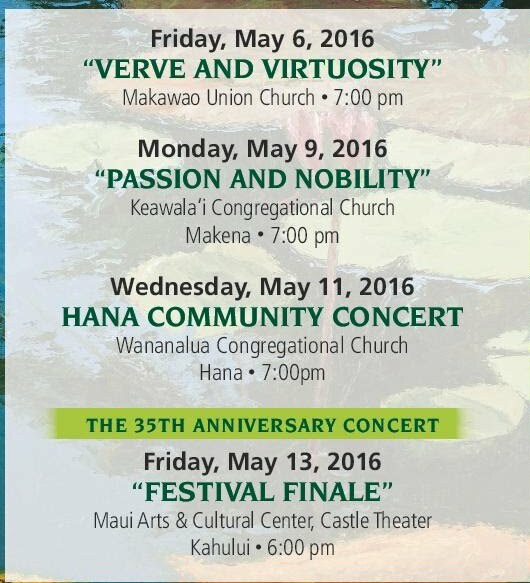 Maui Classical Music Festival at different venues throughout the island. Friday, May 6, 7pm – 9pm Let’s Dance event for Maui Matsuri. The Maui Matsuri dance event will include obon odori (bon dance) practice. FREE! UH Maui College, Kahului. Friday, May 6, 6:30 pm and Saturday, May 7. Mother’s Day Concert. Free roses and other prizes to moms. Queen Kaahumanu Center, Kahului. Saturday, May 7, 9 am – 4 pm. Seabury Hall Craft Fair. 480 Olinda Road, Makawao. 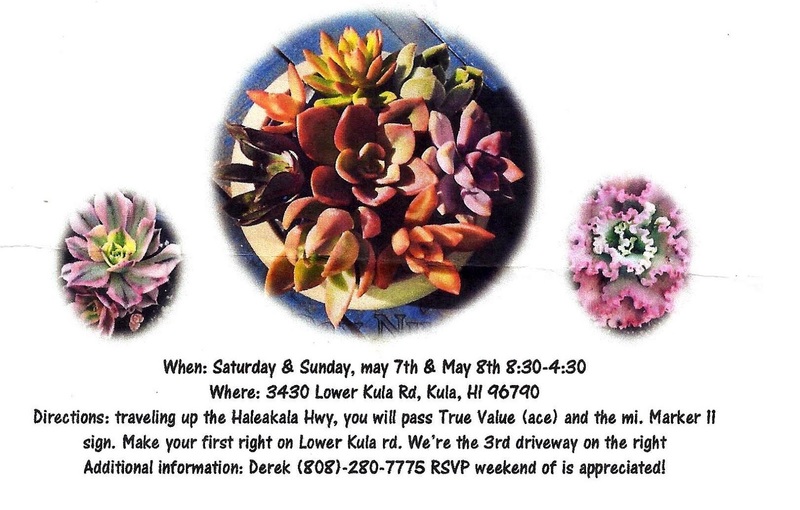 The premier craft fair on Maui, which is held the Saturday before Mother’s Day. $5 admission, children under 12 are free. Saturday, May 7, 10 am – noon. Boy’s Day. A Japanese holiday celebrated to honor boys, Crafts and giveaways. Queen Kaahumanu Center, Kahului. Saturday, May 7, 4 pm – 9 pm. 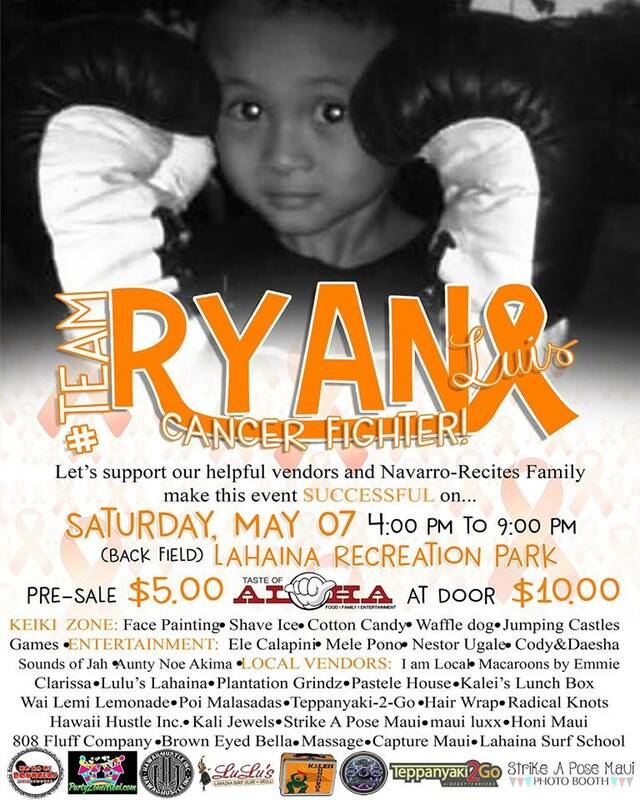 Fundraiser for Ryan Luis. Keiki fun zone, entertainment, food booths, and family fun. $5 admission. Lahaina Recreation Park (Back Field). Saturday, May 7, Free Comic Book Day at all Maui libraries. While supplies last, 1 free comic book per child. Introduction to Drawing Workshop at 2 pm, Makawao Library. Free. Saturday, May 7, 2 pm – 9 pm. Maui Matsuri Festival. Japanese & Okinawan cultural entertainment, food & craft booths, demonstrations & exhibits, cultural crafts and games for kids, manga & art contest, hanafuda contest, eating contests, Cosplay (costume) contest, video-gaming, obon dancing, and more. FREE! UH - Maui College, Kahului. Saturday, May 7. 1 pm – 5 pm. 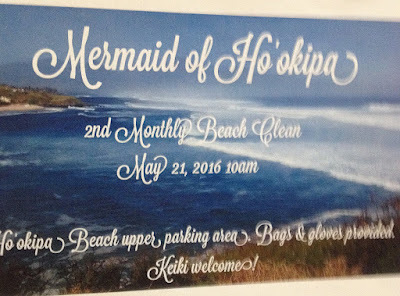 Paddle Imua, a benefit race for Camp Imua starting from Maliko Gulch and ending at the Hawaiian Canoe Club in Kahului. Non-racers can watch the event and participate in the free Ohana Festival starting at 1 pm. Saturday, May 7 and Sunday, May 8. 3rd Day Nursery Mother’s Day Potting Party. Bring your own pot, a bag of fluffy potting soil, and select beautiful succulents to plant. Call Derek, (# is below in the photo) to RSVP. Kula. Monday, May 9 – Friday, May 13. 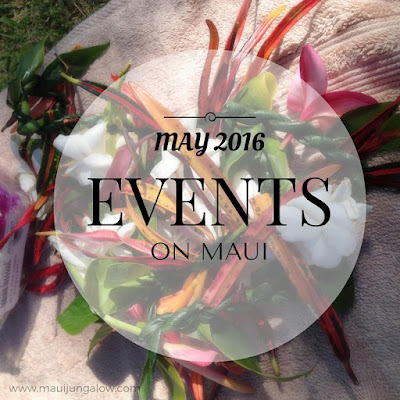 Maui Small Business Week. Free classes and workshops, times and locations vary. Register in advance. Friday, May 13 – Sunday, May 15. Maui Start Up Weekend. Maui Economic Development Board, Kihei. Pitch your start up idea, create a business plan, and form a company in one adrenaline-filled weekend. Friday May 13, 4 pm. Fry Day – Chicken & Waffles Eating Contest. Oceanside Maui, Maalaea. Friday, May 13 – Sunday, May 15. BTG Drops the Beat. 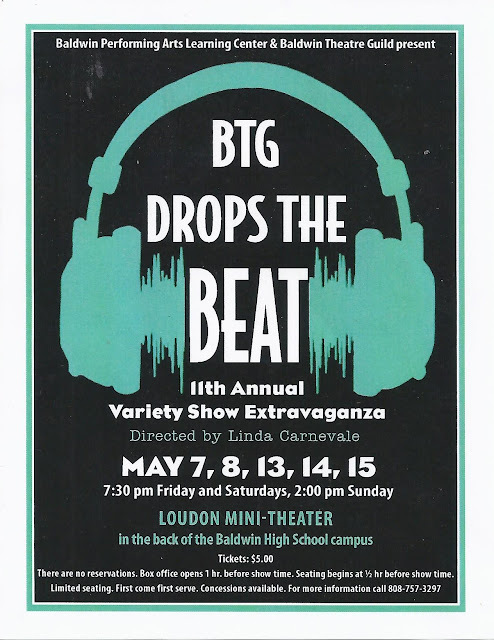 Variety Show Extravaganza by Baldwin Theater Guild. $5, no reservations needed. Baldwin High School. Saturday, May 14, 8:30 am – 11:30 am. Haleakala Photo Safari. Limited to 20 people. Free. Saturday, May 14, 7 am - 9am. Maui Visitor Industry Charity Walk. Kahului. Raise money for your favorite local nonprofit. There is live music, entertainment and food along the 3.1 mile walk. Must register in advance! Saturday, May 14 – Sunday, May 15, 9 am – 5 pm. 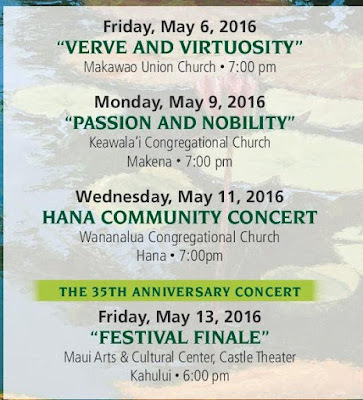 Na Hoku Hanohano Music Festival: Mele Mei Ma Maui. 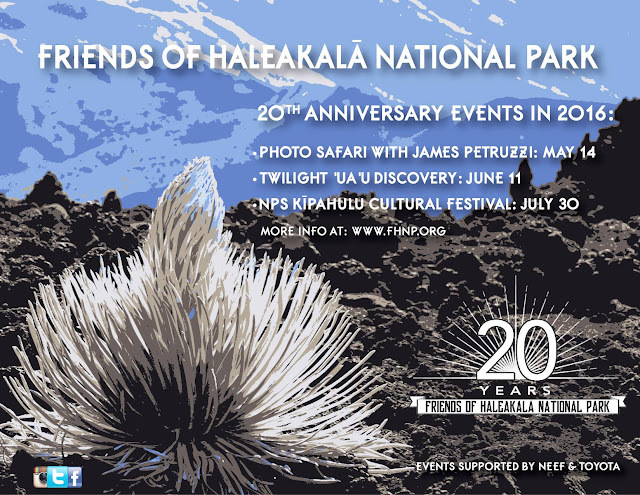 An international celebration of Hawaii’s music, hula and culture. Saturday, May 14, 4 pm – 7 pm. Maui Brewers Festival, Maui Arts and Cultural Center, Wailuku. Plenty of food and beer. $65+ with ID. Saturday, May 14 and Sunday, 15. Holy Ghost Feast. All day Saturday and most of the day Sunday. An annual celebration of Pentecost, 50 days after Easter, and a fundraiser for the Holy Ghost Church. 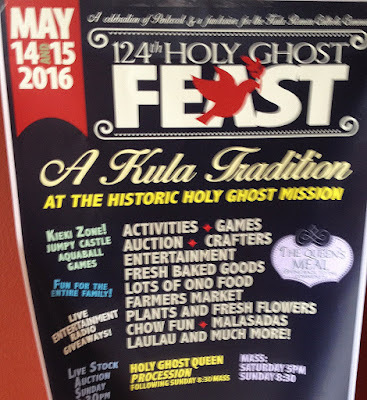 A religious and community festival, with mass, the Queen’s meal (free laulau), children’s games, farmers market, entertainment, and activities for the family. Open to everyone. Saturday, May 14. Wild Drinks Workshop with Sunny Savage and Emily Han. Learn to craft delicious and healthy drinks with fresh and wild fruits, flowers, and herbs. $30. Haiku. Saturday, May 21. Edible Hawaiian Islands Farm Day. Pick a participating farm to visit and follow along on social media using hashtag #EHIFarmDay16 For Maui, two choices include visiting the Maui Farm and Hana Ranch Provisions. Saturday, May 21, 10 am. 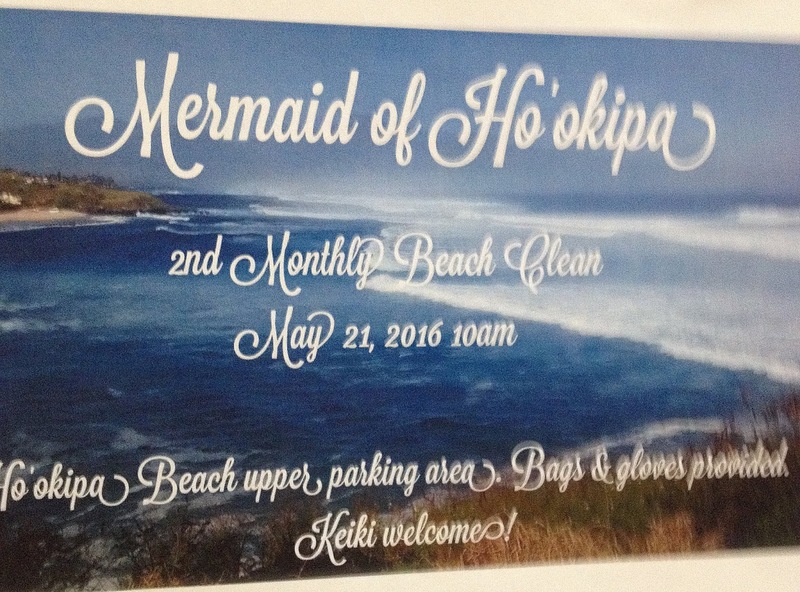 Mermaid of Hookipa Beach Clean Up. Meet at upper parking area. North Shore. Saturday, May 21. 7:30 pm. 3D Film, Jazz & Electronic Music presented by Ebb & Flow Arts. Iao Theater, Wailuku. FREE. Sunday, May 22 – May 28. Wailea Restaurant Week. Participating restaurants in Wailea offers special pricing and 3-course menus, benefiting the Maui Food Bank. Friday, May 27, 9 am – 1 pm. Blossoms for the Brave 2016. Maui volunteers will make leis to honor graves of veterans at the Makawao Veterans Cemetary for Memorial Day. County Building lawn, Wailuku. Bring flowers and lei materials. Saturday, May 28, 8 am – 1 pm. 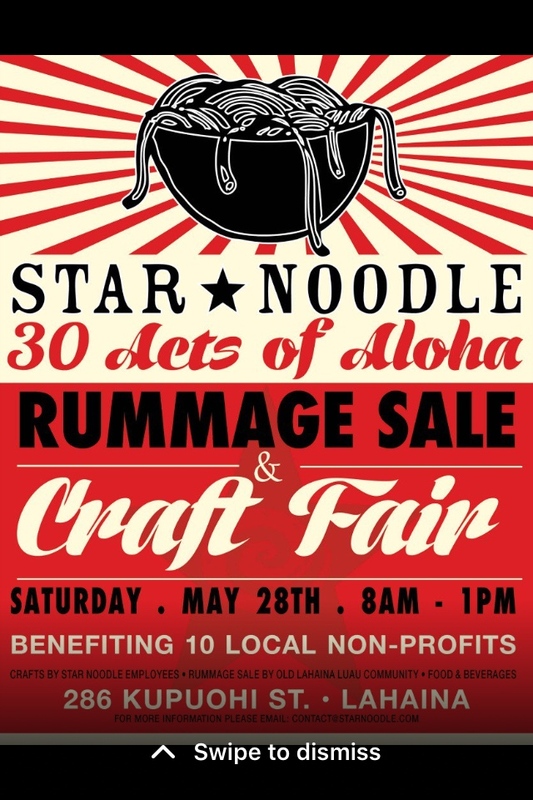 Star Noodle Rummage Sale& Craft Fair, part of the 30 Acts of Aloha. Benefiting 10 local non-profits. 286 Kupohi St., Lahaina. Ahimsa Farm Sanctuary usually hosts vegetarian farm to table dinner and music events on Saturdays.